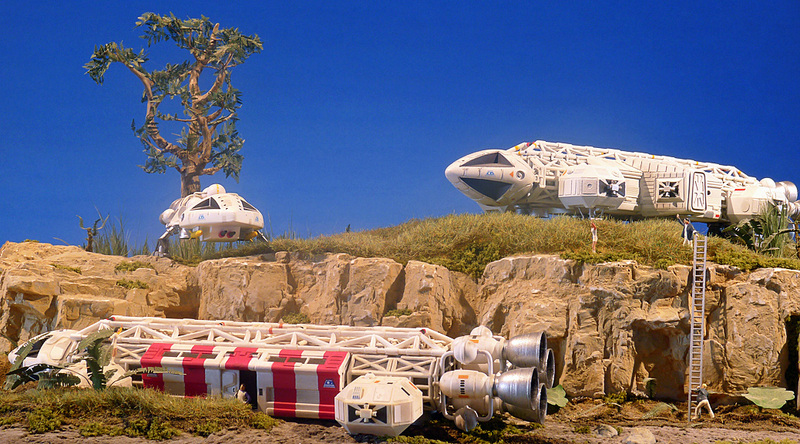 The iconic Eagle from Space: 1999 is one of my favourite spaceships, and Brian Johnson’s masterfully orchestrated crash sequences were the inspiration for this diorama. The crashed Eagle is a modified MPC kit (rebuilt spine and passenger pod, drilled out and reshaped thrusters on command module, accurized main engines). The Lab Pod Eagle is a Warp resin kit (built out of the box). The Gunship Eagle is my own design, a kitbash using MPC Eagle parts, aftermarket resin missiles, landing gear from the MPC Darth Vader Tie Fighter kit, and various other pieces from the spares box. The repainted HO scale figures from Preiser fit the MPC Eagle perfectly, suggesting that the kit’s true scale is closer to 1:87 than 1:72.